Most people see a wide range of colors, which helps them distinguish objects and movement. Rats have poor vision and see only a few colors. They probably see color about as well as a person who is colorblind, perceiving certain colors as shades of gray. Rat eyes have the same basic physiology as the eyes of people: they contain structures called rods that helps detect changes in light, and structures called cones that detect color. The difference is that people usually have three types of color cones, while rats tend to have two, and very few of those. It's likely that they have some perception of blues and greens, but not of reds. They can see colors people can't, however, specifically colors appearing in the ultraviolet wavelength. The many rods in their eyes also allow them to detect small changes in light that people might not notice. People don't usually feel handicapped by their inability to see in the ultraviolet spectrum, but those colors provide a valuable service for rats. For example, we can see urine markings from animals by using a black light to illuminate them, but rats can see them without extra gadgets. This helps the rats find new territories and avoid those inhabited by other rat families. Also, it helps the rats see during twilight hours in the evening and early morning. Colors often appear faded at these times to humans, but rats can see even more clearly than during their normal nocturnal ramblings. People with 20/20 vision supposedly have the best of both worlds—the ability to see up close and far away with clarity and definition. Rats have poor visual acuity, equating to vision of about 20/600 in a human; in other words, they are very nearsighted. Any objects more than a few feet in front of a rat will appear blurry; the rat might be able to tell something's there, but he won't be able to determine the exact shape. 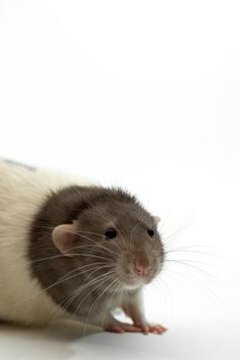 Rats don't worry about their eyesight so much because their other senses are highly developed. In close quarters, their whiskers help them. These sensitive structures help them find their way, determine dangerous path options and recognize familiar textures. Their sense of smell enables them to find food and recognize family members, and their hearing is very acute—they can hear not only all the sounds we can, but many that are too high-pitched for the human ear. These high-pitched sounds include most rat vocalizations, so without special equipment we never even know they've made a peep. Rat Behavior and Biology: What Do Rats See?